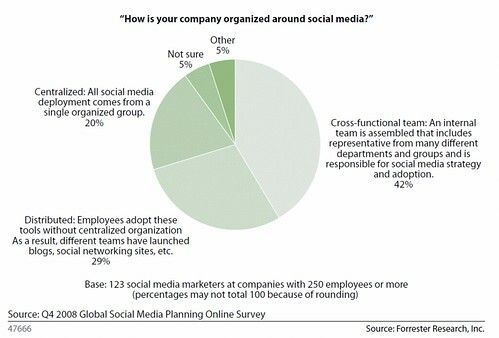 I often get asked by brands: “How should we organize our company for social media?” or “Which roles do we need”, or “Which department is in charge”. So for our latest report (clients can access all the details) answers just that, it has data and graphs about spending, brand maturity in the social space, which department ‘owns’ the program, and how companies are organizing. The Tire (Distributed): Where each business unit or group may create its own social media programs without a centralized approach. We call this approach the “tire,” as it originates at the edges of the company. The Tower (Centralized): We refer to this centralization as the “tower” — a standalone group within a company that’s responsible for social media programs, often within corporate marketing or corporate communicaitons. Which way should companies organize? We believe the most sophisticated and effecient way is the Hub and Spoke, which provides centralized resources that can support business units. The business units still have the freedom and flexibility to dialog with the market –and should be in alignment with what other spokes are doing. Social doesn’t impact one department –but impacts marketing, pr, product, services, support, and development –every customer touchpoint. On a related note, thanks to heavy collaboration with colleague Zach Hofer-Shall we’ve also published a report for clients on a community launch checklist. This checklist reminds brands that 80% of their success is dependent on understanding their customers, defining an objective, and assembling the right strategy that encompasses: plans, roles, process, budgets, measurement, and training –not a focus on technology. The faster brands can realize that approaching social marketing and collaboration isn’t about technology, but about process and change management the better off they are. You’ll find simliar thoughts from David Armano –who’s scoping out different models within their framework of social business design. Love to hear from you: Which way is your brand organized? In a tire? tower? or hub and spoke. In my experience, I often ask stakeholders in companies to vote by raising their hands on which model they think they are –most often, not everyone agrees –but most want to evolve to hub and spoke. Try polling your internal teams to start a lively discussion. Update: David Armano responds, and points out there can be multiple hubs and spokes in a single corporation. We’ve found this in large CPG and Tech titans, this model can work well.